chromaticism's review"Handy 4-Track Recording Studio"
The Zoom H4n is described as a handy recorder (hence the "H"). It's a pocket-sized unit about as long as today's bigger smartphones with about thrice the thickness, capable of recording four tracks. It has four channels available for recording, two of which are dedicated to two built-in condenser microphones. The other two channels come in the form of two combo XLR/TRS input jacks. The unit can be powered via an included wall-wart power supply, USB bus power, or two AA-sized batteries. It stores data via SD cards and will accept cards of up to 32 GB in capacity. A brand-new Zoom H4n will come with a protective plastic case, a windscreen, the previously mentioned wall-wart power adapter, a USB cable, a 2-GB SD card, and a Cubase LE 5 CD. The front panel shows us the familiar transport controls, mute/arm switches for built-in mics and input jacks, and a big monochrome LCD screen. The right side panel shows independent controls for output and input volume levels, menu navigation controls, and the SD card slot. The left panel reveals a headphone output, AC adapter input. When opening up the battery cover, you will see the small "Stamina" mode switch. 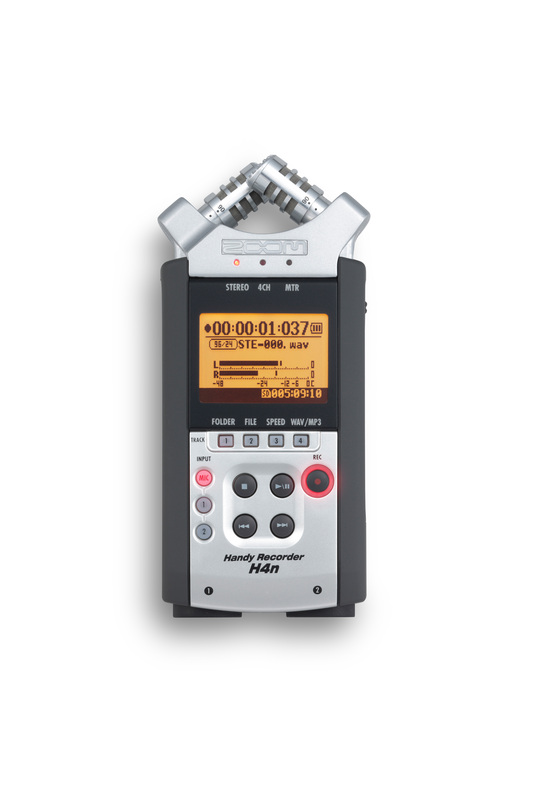 The Zoom H4n can function both as a standalone recorder or as an audio interface once connected to a computer via USB. As a standalone recorder, it can function in three modes: Stereo (default), 4-channel, and Multitrack. When used in one of these modes, the recorder is capable of recording audio data in WAV format of up to 24-bit/96-kHz resolution. To save SD card space, one can also set the Zoom H4n to record in MP3 format. However, I would advise against recording in MP3 format if you want to get more professional sounding results or if you want perform further mixing and editing of the audio files after recording. Stereo mode is pretty much straightforward to use. Upon turning on the Zoom H4n, it starts up in this mode and you can start recording immediately. Hitting the record button once will activate the microphones or input jacks but will not start the recording process. At this stage, you will see the record button's border flashing a red light. This step provides the opportunity to check microphone input levels, allowing the user to adjust the levels and ensure that there is no clipping. To start recording, the user must hit the record button for a second time, and the light will stop flashing. In this mode, the user have the choice of recording via the default microphones or external microphones connected to the recorder via the XLR/TRS input jacks. To be able to record using the built-in microphones and the XLR/TRS jacks simultaneously, the user must switch from Stereo mode to 4-channel or multitrack mode. In multitrack mode, one can record four mono tracks simultaneously, a function very similar to vintage TASCAM 4-track tape recorders. A user may also set up two mono tracks as a single stereo track. One thing that's very good about the Zoom H4n's multitrack mode is that it is possible for the user to perform a variety of recording studio/DAW functions such as panning, EQ, and inserting effects, functions that are certainly very useful for creating professional sounding recordings through just the use of the recorder itself. There's also a variety of effects that a user can insert into each track, most of which mimic popular effects pedals, guitar amplifiers, or a combination of both, which is quite handy for users who would like to plug in their guitars directly and start recording. As an audio interface, it is a plug-and-play device that will record at a maximum of 24-bit/48-kHz resolution. It is immediately recognizable by many DAWs such as Cubase, Ableton Live, and Logic Pro. While functioning as an audio interface, one may choose the built-in mics or use the combo jacks to record using external microphones or instruments like an electric guitar or synthesizer. I have great appreciation for the many features of the Zoom H4n and I am very satisfied with the sound quality it can deliver. The built-in condenser mics have a flat response, thus they are able to record audio without any tone coloration whatsoever, making then very useful for recording things such as lead vocals and samples. The packaged windscreen is perfect for cutting out wind noise when sampling and it also physically attenuates the built-in mics to some degree, making it easier for me to get the levels right when recording various spaces (such as a concert hall, etc.). The multitrack function is also very important for recording while away from my home facility. Projects recorded under different modes are stored separately into well organized folders inside your SD card, and so it's easy to organize everything you record with it. Now, here's what I don't like about the H4n. First, the protective plastic case provides a snug fit for the unit, therefore you cannot fit anything else. This will require you to have another case or bag for it in order to fit all the accesories you might use for it. Another thing is that navigating the menus needs a little bit getting used to. Lastly, some functions such as importing stereo tracks into a multitrack project is not straightforward i.e. you need to manually convert two mono tracks into a single stereo track before you import your stereo audio file. Overall, I still do think that the Zoom H4n is a very useful handy recording unit for the musician who's constantly on the road. - Various modes useful for many recording situations. - Plenty of professional/prosumer features. - Included plastic case only fits recorder, requires another bag or case for accessories. - Menu navigation needs getting used to. - Some features are not straightforward. I work with videogame soundtracks and bought a used Zoom H4n to record ambiences and outdoor sounds in general. Mine one has a pretty nice plastic case, an AC adapter (but can run on two AA bateries as well) and an USB cable, and I've bought a separate 16gb SD card to use with it. It has two condenser microphones, two extra inputs for additional mics (which can be phantom powered) or line DI/sources, and you can use all these 4 channels at once. It records wav files (up to 24bits and 96kHz) and mp3's. The usb cable is not only to transfer files to your computer, but can also make the unit work as a regular audio interface, nice resource. Besides that, it has a few built-in effects (compressor, amp simulator, delay, etc) that are not good (you might wanna use them to plug your guitar and practice with a headphone... might) and a small speaker that is usefull to have a quick listen to a file and make sure that everything is working fine (of course, you can also do that with a headphone). The construction is robust and it looks like it could handle some hits and falls with no problems. I don't have much experience with portable recorders, but I can say that the pre amps on the H4n are not as good as the ones from a regular audio interface in the same price range. But they are not awful either: you can get some usable sounds from the stock mics and some very usable sounds if you use a couple external ones. I usually end up always boosting a little top end and cutting a little around 200Hz, 300Hz from the files recorded with the H4n. One thing I really like is that the stock mics can be twisted to open up the angle of the stereo XY recording, from 90° - good for stereo instrument recordings - until 120° - good for my ambiences because they sound large and fill up the stereo spectrum nicely. Being able to do it without any other mic is really handy. I don't really like the little screen and think that navigating through the unit's functions could be easier. Anyways, you can still learn how to use it and get your work done. Overall, even with its problems I think that the H4n is a good product, that does its job well (which for me is to record stuff out of the studio, but you can easily find other applications) without taking much of your money. If I had to buy another portable recorder I would probably look around for other models before just to make sure that there is something better around nowadays (I would trade the effects for better pre amps without thinking twice, for example), but I'm pretty sure I wouldn't find anything as good and as practical as the H4n for this price. What I find particularly magical about the Zoom H4n is that it just works. I do not actually own the product, but I know a bunch of people with them because of their popularity, and man, do I want one. 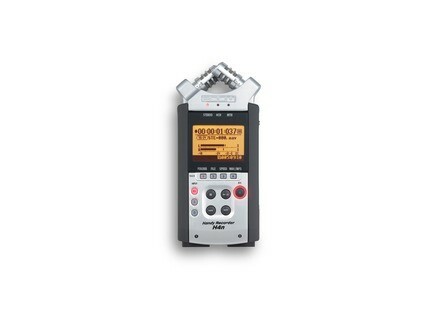 The Zoom H4n is a portable recorded with two very high quality condenser microphones built into them, and it has two inputs for line or XLR in the bottom. What I find particularly beautiful about this thing is the simple fact that it is so portable. No, you’re not getting the best sound with the thing, but it is still far better than lugging an entire setup around to record a couple of things like traffic or rain or anything else you can think of. In fact, I want one of these just because of the enormous capacity to record environmental sounds and its sheer convenience will ensure that an idea will never be missed again! To be fair, Zoom’s documentation and menu system are not the greatest things in the world, but you quickly learn to forgive that when you realize that this product is not designed to be particularly intuitive in its operation. All it is particularly designed to do is to get you hitting that big red button fast. And once that button is hit, you have captured everything you need for an idea, or if you even need to quickly plug in a couple of microphones to record something of higher quality really quickly, then this is a great tool. If you are not worried about actual sturdiness or sound quality, this product is frankly a whole load of overkill, but if you want something that can get your creative juices flowing and something that will be there with quality when you need it, the H4n is definitely for you! I've been using it as a sound notebook since I bought it: I record everything when I play guitar or synth so that I can keep my ideas and improve them afterward. I also record my rock band but it's more difficult to get a balance between instruments. It's a convenient product. It's my first portable recorder and I'm very satisfied with it. Things I like least: all the small gadgets I don't use (amp simulation, etc.). They sound digital but could become useful one day. Based on my experience, I would buy it again. Before you decide to buy such a product, you have to know what you plan to do with it. It won't replace a computer with a good sound card to record every instrument separately with Sonar, for example... But you can record anything... for instance the sound of the sea. Afterward, you can mix the sound with pictures from of your camera. It's small so you can take it anywhere... It's a valuable tool for composers. Don't hesitate to contact me if you need more information... Otherwise, you can read the user's manual on the web. A last comment: the integrated speaker sounds awful but the sound is great with a pair of headphones. Originally written by Pv44 on Audiofanzine FR. voyard's review (This content has been automatically translated from French)" Very well but sometimes too much is too much ..."
I have the last few months. I have an Olympus LS11, a Zoom H2n, a Zoom R16. What I like most or least: Plus, the quality of the microphones in an XY position, the only feasible on such a device outside the MS couple who both allows a good stereo. In my opinion, please do not use pseudo couples A / B (Olympus LS11 and other Tascam DR-07 MK2 or other DR40. Q / P is acceptable in the sight of functions available, but I do not use them all. I am primarily a hunter sounds, birds, traffic, industrial sounds, various soundscapes, atmospheres markets, but also quite taken my batteries "over head" position. Taking its quite up to par. The least. Its size and weight, its sensitivity to wind (do not buy all these devices without a windscreen of Rycotte type ". Restitution soundscapes and stereo image are perfect! Its ergonomics are a bit special but we made it. No risk of noise contacts, even walking to the condition put in his hand, not to keep it. My only regret too full and a tool such as the H1 would perfectly satisfied me in terms of controls (sufficient) and their accessibility, but without the flaws that seem to characterize. For the future? A more compact H4n and a little simplified in its overcrowded and sometimes useless function. To models, nothing beats a true multi R16 or R24 ​​guy? LoEnzo's review (This content has been automatically translated from French)" Are job well done!" I use it for two years, this is my the first portable recorder, I wanted a good value with two inputs with XLR report. I use it to record rehearsals the group to keep the original idea of ​​our creations. The sound is very end may be a bit too, quite acute but still very clean, little is still tweaking the sound with EQ. Nice side for guitarists travel with amp simulator for electric guitar I like! Used since May 2010 to replace a stolen H2. This is clearly the best gear. The H4 H4 seemed like the best value for this pric kind of tool. I know a little like Tascam and Sony and is kif-kif it seems. I love its versatility and price. 2 2 (mics + mic / line) is great for capturing a live band eg. And USB interface mode is ultra convenient when you are walking with your laptop, you can maquetter comfortable. I do not like the fragility of the buttons above the wheel "menu" to be the weakest link so it is biased and so it did not look solid. Microphones also naked not look very sturdy. Converters cashing although their saturation is sometimes nice. I would do this choice if real glue Zoom buttons above. But for 250euro new (at the time) it's pretty amazing what you pay for. jrozen's review (This content has been automatically translated from French)" A small wonder"
--- How long you use it? --- Did you tried many other models before buying it? I had the previous model (Zoom H4). The jump in quality and usability is huge. --- What is so special that you love the most, least? Its portability: you can have it permanently with either, with just one set of batteries standard parts, and quality of microphones embedded saves almost anything. If care is taken to keep it without moving his fingers, we hear absolutely no noise of friction (contrary to what I read here and there) ... I recorded on the fly more than one half-hour of music on instruments Baschet taking the unit to a single hand without rubbing noise. He can do it!! no breath annoying, and can simultaneously use the microphones to the edge to capture the mood in four simultaneous tracks, we will mix later as desired. This is huge! Posted on mini tripod, it is forgotten. It is a small portable studio that is very versatile. Ergonomics very correct. Menu quite readable. Easy to use. --- How do you rate the quality / price? Yes, Q / P amazing, but I have not tested the new devices released after. SampleScience's review (This content has been automatically translated from French)" a very good purchase"
I use the Zoom H4n for about 2 years and so far I have very few negative comments to make about him. Side price / quality ratio I think is the best device of its kind on the market, the sound quality is simply stunning, the sound is clear and detailed and there is virtually no unwanted background noise. Crystal clear! The only drawback is that if one does not put the microphone boume there are little sparks (or pinging) sound that seems due to the static (or at least it is similar to the static). I made several long recording times with the H4n and I'm also served to record acoustic percussion. With this device I have made some bookstores its high quality commercial. I also recorded a choir in a church using a tripod, this is the only record that I was somewhat disappointed, the main reason being that the H4n is not doing to capture the sounds of a single direction, it really is a "field recorder", its use to record instruments or a live band is not ideal because the device will also capture all the ambient sound in great detail. It is still possible to record instruments in a controlled environment, the sound quality is so amazing! MURDER IN THE KITCHEN's review (This content has been automatically translated from French)" Excellent product"